Further to my last birth picture posting on 22 May (please see Phoebe post), I have had a couple of messages asking me how the colour is ‘built up’ to complete the illustrations. On one of my latest commissions, I have tried to photograph the different stages (I was halfway through the commission when I thought of it), to show you how this is achieved. To be brief, the colour is built up in stages and because there (probably) isn’t a specialist coloured-pencil to match each and every colour required in the illustration, these pencils have to be blended to create the desired hue and shade. I usually play around with the name in my mind’s eye and try different variations before I begin to start putting blue pencil to paper. 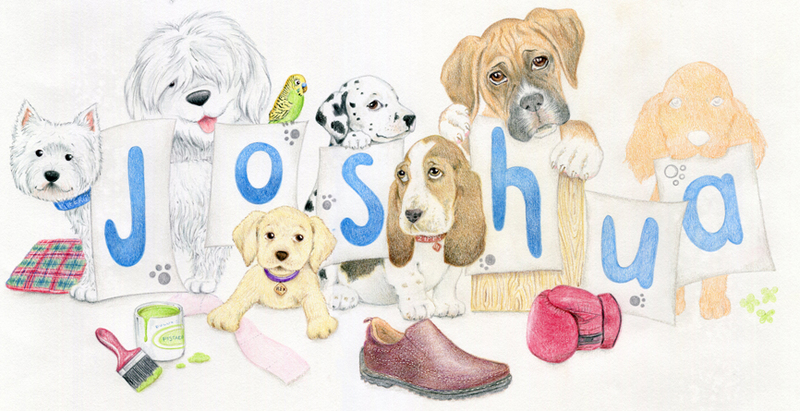 I wanted the dogs to be quite interactive in this illustration, so came up with the idea of the canines holding the letters of the little boy’s name. I had originally intended to do different coloured food bowls for the dogs, but changed my mind at a later date. I produced a more detailed sketch of what I hoped the final illustration would look like. I have had a good idea from the clients what they are expecting and they (a family of dog lovers) have also let me know what breeds they would like to be included. From the list, I chose a West Highland Terrier, Old English Sheepdog, Labrador, Dalmatian (one of my favourite breeds of dog), Basset Hound, Boxer and, finally, an Irish Red Setter. I chose various implements to surround them with (rather than the dog bowls I had previously decided upon), which represent their characters (often as they appear in the world of the media). From the sketch a final pencil drawing is created. This will be coloured to create the final piece of artwork. 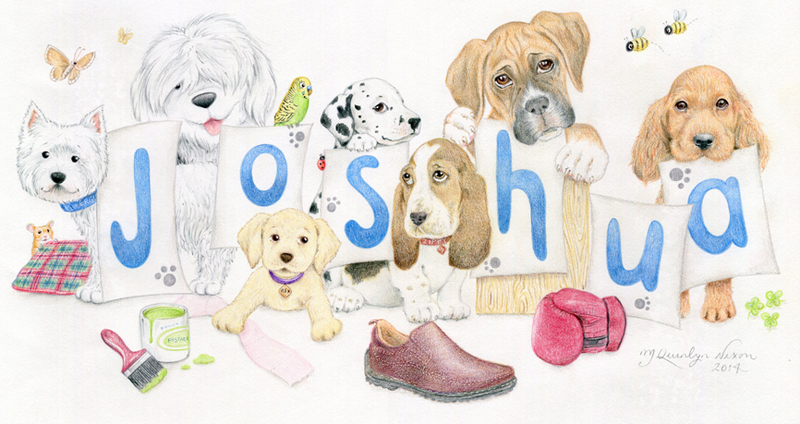 You can see the pencil drawing at the right-hand side of this picture, where the Boxer and Irish Red Setter are shown as feint outlines. I have started colouring the illustration, adding in a rather ‘fetching’ cushion, which shows the West Highland Terrier to good effect! 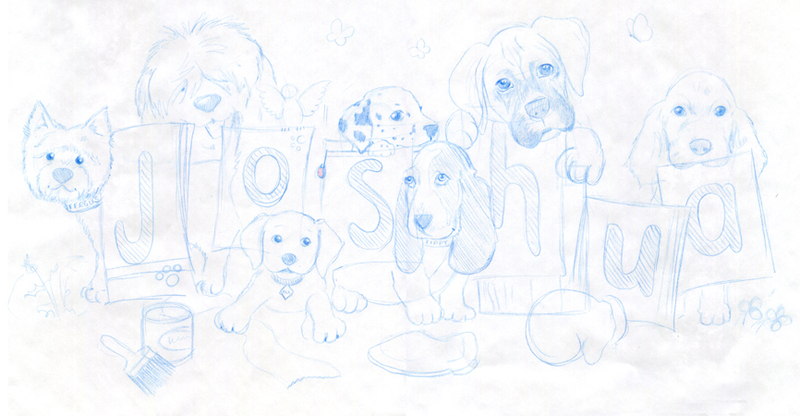 I am now beginning work (you can see from the illustration) on the Basset Hound. Already I am blending different colours on the dog’s side (see under the letter ‘s’). I have also started adding in a second colour (this one is raw sienna) on the right-hand side of the dog’s head. I’ve also begun work on the maroon-coloured shoe (I won’t say the possible brand name), which sits in front of the Basset Hound. At this stage, the work is complete on the Basset Hound (I may touch it up later, but the majority of the work is complete on him). The maroon shoe is finished too. I have started work on the Boxer; this is at a more advanced stage than the Basset Hound was in the previous illustration. I have also started to put the first ‘coat’ or layer of colour on the boxing glove. The wooden box, which he is sitting in, is about halfway complete at this stage. The Boxer and his crimson glove are finished. 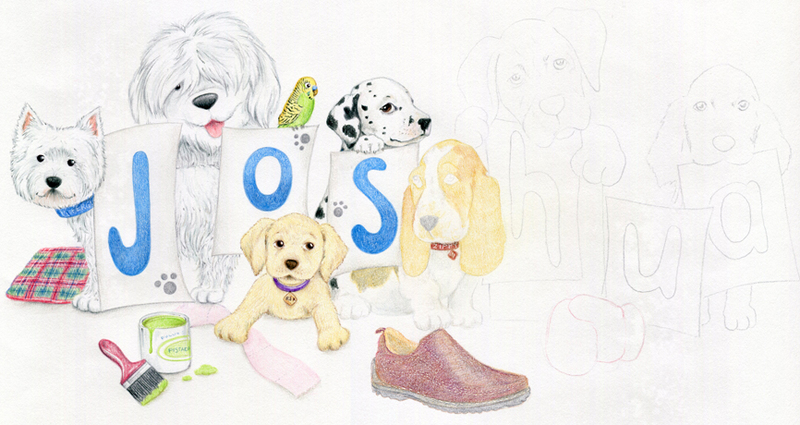 I am now working on the letters ‘u’ and ‘a’, along with adding the first two layers of colour to the Irish Red Setter’s coat. Building up the colours can be quite time-consuming (having to look for different coloured pencils and blending them), but it all depends on the subject. The Setter is more or less different shades of the same ‘colour family’, so this will not take as long as the Boxer or the Basset Hound. 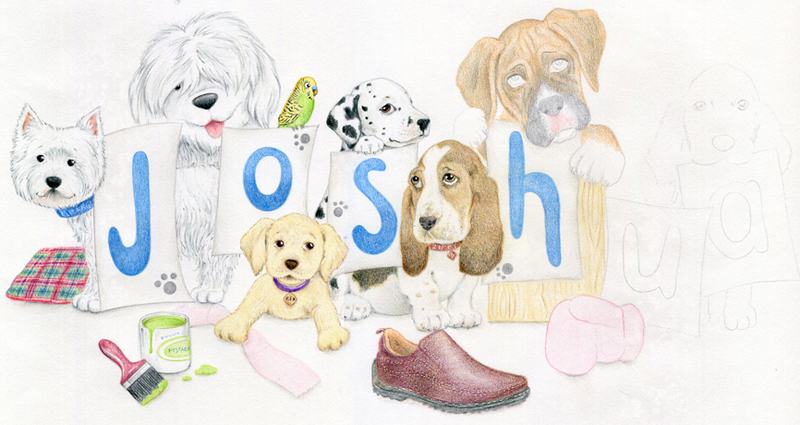 The final illustration will then be completed with the name and personal details relating to Joshua’s birth. I am pleased to say that the family were delighted with the picture and are going to come back to me when they have their next ‘new addition’ to the family.